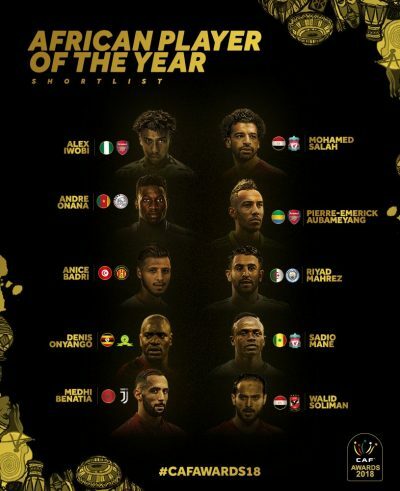 Super Eagles winger, Alex Iwobi, has made the top 10 shortlist for the African Player of the Year for the forthcoming CAF AWards 2018 while Ahmed Musa failied to make the cut, reports Completesportsnigeria.com. Also on the top CAF Awards shortlist are Gabonese forward, Pierre-Emerick Aubameyang and Senegal’s Saido Mane. Liverpool star Mohamed Salah who won the honour in 2017 after a sizzling season for the English Premier League side is also among the nominees in the shortlist. Musa, who was Nigeria’s star performer at the 2018 FIFA World Cup in Russia has enjoyed a fantastic debut season in the Saudi Professional Football League with Al Nassr was a surprise omission from the list. Another Super Eagles player, Wilfred Ndidi is in the running for the Youth Player of the Year for CAF Awards 2018. The Leicester City midfielder will slug it out with Morocco ‘ s Achraf Hakimi and Franck Kessie of Ivory Coast for the prize. In the Women’s category of the CAF Awards 2018, Asisat Oshoala, Francisca Ordega and Onome Ebi made the shortlist for Women’s Footballer of the Year award. Other big names nominated for the award are; Thembi Kgatlana of South Africa, Cameroon’s Gabrielle Onguene, Mali ‘ s Basira Toure, South Africa captain, Janine Van Wyke and Ghana’s Elizabeth Addo. Nigeria's Asisat Oshoala won the individual honour in last year's CAF Awards. 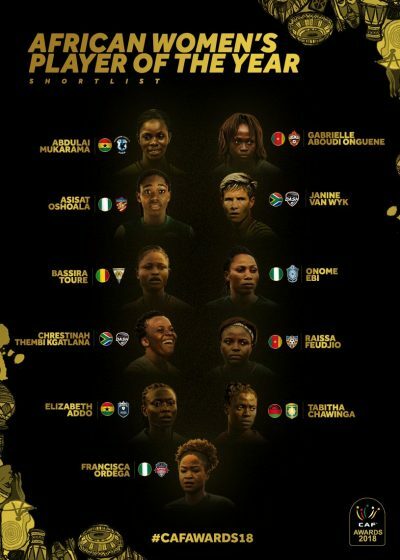 The Super Falcons are also in the running for the Women’s Team of the Year with the Banyana Banyana of South Africa and Indomitable Lionesses of Cameroon also included in the short list . The shortlisted CAF Awards 2018 nominees were decided by votes from the members of the CAF Technical and Development Committee. The CAF Awards 2018 Gala will take place on Tuesday, 8 January 2019 in Dakar, Senegal. I can confidently say Iwobi won’t win his category and Oshoala will not retain her crown either. Ordega might get in on the last 3, but winning it is 50-50 with SA’s Kgatlana, Ghana’s Elizabeth Addo and Cameroun’s Ougene. Musa deserved to be in the Top 10 at least if not top 3 for his performance this year both for club and country. After helping CSK Moscow get to Europa League Quater final and 2nd in Rusian league scoring crucial goals. Then in the world cup He was the most outstanding African player scoring two of the best goals that lit the world cup. Then he continued he good scoring form for Nigeria helping qualify for the Nations cup and also for new club in Suadi Arabia. Currently has scored 10 goals in 19 games, with one hattrick. He definitely deserved to be in top 10 far more than Iwobi. Football is not only played England or Europe. Musa plays in Saudi Arabia. Apart from the brace he had against iceland in WC he hasn’t had any other fantastic performance since then. He doesn’t deserve to be in the top 10, Ndidi does…..he was the top tackler in the top 5 leagues in Europe. He’s too good to be in the ‘best youth category’. He was a key to Ighalo finding form in the AFCON qualifiers. He deserves to be in the nominees. Really good points and well balanced pieces of evidence to justify your position. Thanks Ikeben, Musa indeed has done enough in my view as well to deserve to be in the top 10.